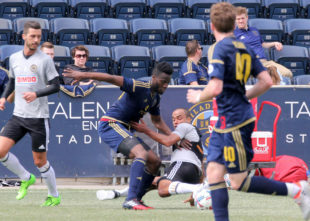 Lost in Philadelphia Union’s winless ways, Bethlehem Steel FC were mired in their own misfortune. While the Union haven’t won since last August, Bethlehem’s last win came against Wilmington Hammerheads FC on July 14, 2016. A Philadelphia Union (affiliate) has won! Combined, the two teams had failed to win in 26 consecutive matches. Bethlehem ended the streak Sunday, defeating FC Cincinnati 2-0. Several players performed well, but one stood out among the rest. Seku Conneh is PSP’s player of the week as well as the USL player of the week. Watching Conneh play this year, it is surprising his numbers were that low last season as he has all the tools to be the goal scorer he’s been so far this year. He has the pace and technique to excel in the USL. While both goals came after Cincinnati were down to ten men, Conneh’s skill was evident. On the first goal, the forward displayed a lovely first touch. He gathered a hopeful long ball from newly minted holding midfielder, Jack Elliott. After blowing by his marker, Conneh made the slightest feint and left another defender on the ground before calmly placing the ball in the far right corner of the net. The second goal was a poacher’s goal. Santi Moar did the hard work making a tremendous run before seeing his attempt parried away by the keeper. Conneh was there to tuck in the rebound. But maybe the forward’s most meaningful moment came before the opening whistle as Coach Brendan Burke named Conneh the fifth captain in Bethlehem’s history. It is well known the Union prefer to use a 4-2-3-1 throughout their system and Burke pretended to oblige. His lineup featured forward Cory Burke as the attacking midfielder with Conneh alone up top. The idea was these two players would exchange responsibilities throughout the game. In actuality, the relationship between the two was more horizontal than vertical as it was a two-striker system through and through. So maybe the formation won’t be as rigid as it seems to be. There is reason to be excited. With Conneh and Burke, the Steel feature two forwards who are worth watching – in addition to Moar, Adam Najem, Marcus Epps, and Yosef Samuel in the attack. If the Union continue on their current path, expect more of those Steel names to pop up in this feature. I always wondered about Corey Burkes potential I remember him pantsing US defenders a couple times during the US Jamaica friendly. I read the Conneh-Burke pairing as defensively supposed-to-be a rotation between being forward and playing behind the forward, while offensively being a highly dynamic top two pairing. And of course the run Burke made to collect the Elliott pass that then led to the penalty award came from more of a flank midfield spot. Both strikers were free to roam and improvise, and Cincy’s lowered resistance level made them especially vulnerable. Do not undersell Jack Elliott’s intent or precision. The ball to burke was deliberate, and the one to Conneh was more than hopeful, I thought it inch-perfect. In the scrimmage Union v Steel that they never call a scrimmage, Charlie Davies 2nd half yell to Elliott to delivery a long ball says that Davies knew Elliott could deliver long accurate balls. Elliott was a DCM in the 2nd half, the only Union player to go 90. I should state that it was much easier to see these complexities and subtleties in person at Goodman than subsequently on You Tube, much. The more I hear about Elliott, the more I think he needs to be starting for Gooch. Lots of interesting things going on with Steel. Thanks for the constant updates. Coach Burke in his conference call earlier this morning said when asked by Evan Villella of Brotherly Game that the biggest change in Conneh this year over last is his mentality. I would add conditioning from where I sit, but coach would know.